Expatriate in KL: Deepavali = A Trip to Penang! Deepavali = A Trip to Penang! Tweet One of the great things about living in Malaysia is the number of holidays one can get. I was complaining (to myself) that I had to work last Nov.1 (which was All Saints Day in Manila) which is always a long holiday that we look forward to. Well, I didn't realize that I should be lighten up about it, since in exchange, I get "new" holidays! My first Ramadan holiday. Next my Deepavali holiday. And of course after those 2 great celebrations, it will be my favorite one -- Christmas! Happily, I discovered there will even be another holiday between now and Christmas, which is Dec 20 (Hari Raya Qurban)! Yehey! During our long weekend celebrating Deepavali (or in Pinoy ... "nakiki-celebrate! "), me and hubby went to Penang for 3 days. It was a pleasant and scenic 4-hour drive from Kuala Lumpur. The highways were well built, which makes the trip easy enough. There were enough gas stations and rest places for short breaks. Penang reminds me of Cebu. KL is like Manila, and Penang is like Cebu where it is a busy place for business, yet it has its laid back charm. Walking down near the coast (at Gurney Drive and also beside Fort Cornwallis) was pleasant, coupled with good weather. It was a nice, leisurely stroll... which could be the same for Philippines' Manila Bay walk-way (except I wouldn't feel too safe walking around there). Accommodations were not as pricey as our trip to Langkawi. We stayed at a boutique hotel called Lone Pine, situated near the beaches of Batu Feringgi. It's a charming place, a nice change from the huge commercial hotels that you usually get. You can even try all sorts of water sports, which is easily accessible when you walk out to the beach area. The swimming pool of the hotel was not bad. We enjoyed a lazy morning by the pool after our breakfast... then a few laps in the pool. We were lucky to get sunny weather as it was raining the day we arrived. I think it's rainy season in Malaysia during November time. The hotel is well located, especially if you enjoy shopping at the night market where the streets come alive. One of the highlights of the trip was the drive up to the enormous Kek Lok Si temple. We wandered around to see the huge statues of Buddha and company. There was even a short electric lift ride to the top floor to see the gigantic statue that they are building on top of the temple. 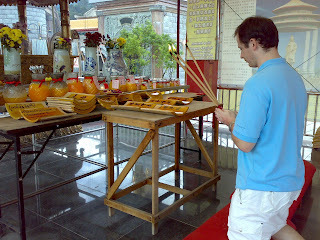 Plus, my hubby got a taste of how to "po-pi" lighting incense and praying to the Buddha. One thing I noticed is they charged a lot of parking fees. And these are fees you pay to people who are hanging around the curb... some may possibly be legal, while others just taking advantage. Every parking stop we did cost around RM1-3 depending on which area. We were able to get a relaxing foot massage at this new place which was situated at Nagore Place. It's a newly opened one, which charged us RM50- per person, plus the additional RM10 which we paid to get our private room. The lazy boy couches were very comfortable, with built-in private TV per seat. Plus, they served great tea and hot soup after our massage. I would say it was well worth our money! After 3 wonderful days, it was time to go back to KL. During our drive back, we stopped by Ipoh to have late lunch before completing our drive home. I surf through malaysia blogs and i found yours. I am malaysian but currently living abroad. I am so glad to found your blog and i love it when u blog about your life in malaysia. It keeps me update what is going on there.Keep it up ! way to go girl..